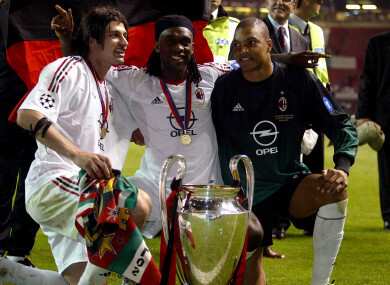 Kaladze with Clarence Seedorf and Dida after winning the Champions League in 2003. FORMER AC MILAN football star Kakha Kaladze has been elected mayor of Georgia’s capital Tbilisi. The country’s election administration said on its website that Kaladze won 51 percent of the vote in the weekend’s municipal election. The 39-year-old played for AC Milan between 2001 and 2010, helping the team to twice win the Champions League. He previously played for Dynamo Kiev and Dinamo Tbilisi and also captained Georgia’s national side. He quit football in 2012 while playing for Genoa in order to devote himself to politics and campaign alongside billionaire tycoon Bidzina Ivanishvili to challenge then-president Mikheil Saakashvili. He became energy minister in October 2012 after Ivanishvili’s coalition scored a shock parliamentary election victory over Saakashvili’s party. In July this year, he resigned to run as mayor of the capital, a city of 1.2 million. In a personal tragedy, his brother was kidnapped in 2001 by abductors who demanded a ransom and took him to a gorge that was a notorious hideout for Chechen separatist rebels. His body was identified five years later. Email “Former AC Milan defender elected mayor of Tbilisi ”. Feedback on “Former AC Milan defender elected mayor of Tbilisi ”.